Got a song, podcast, or another audio track that you want to copy directly to your iPhone, but don’t want to add to your computers general iTunes library? 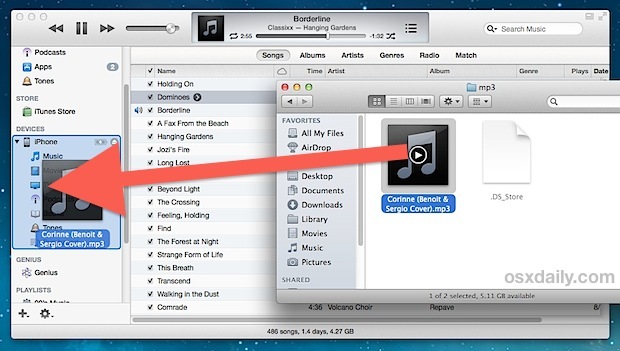 You can skip adding the song to the computer iTunes library completely by using a simple but little known trick, letting you directly transfer music and audio to an iPhone, iPad, or iPod touch. The end result is that you will have music stored only on the iOS device, without having it kept in iTunes as well, completely bypassing the iTunes libraries on a Mac or Windows PC. This is a nice trick for some added control when managing very specific music libraries, using alternate computers, and particularly if a computer is running low on disk space and you’re wanting to copy music directly from an external drive to an iPhone or iPod without importing anything into iTunes. There isn’t much of an indicator within iTunes itself, but if you look at the status bar on the iOS device you will see the familiar syncing logo. 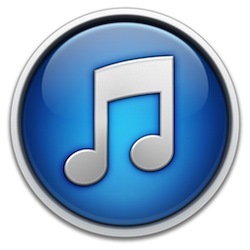 When it’s done rotating, check on the iOS device within the Music app to find the directly transferred iTunes track where it will only be stored on the device and not kept locally within iTunes library, because the standard iTunes importation process is skipped completely. Music and audio can be copied this way with either a wi-fi transfer or USB connection, it doesn’t really matter which you use. For ease of copying directly to iOS hardware, you may want to show the sidebar in iTunes beforehand, that can be done from the “View” menu by choosing “Show Sidebar”, otherwise it’s pretty easy to inadvertently drop the audio file into the general iTunes window and import it into the library, which is exactly what we’re trying to avoid here. What and where i “Finder”??? A song emailed to my iPhone can be played within the email client but is there a way to transfer or copy it from there to the Music app on my iPhone? The painful thing with is though, if you select to manually manage music and videos, you have to first sync with the itunes to do so, thus forcing me to do exactly what I do not want to do. Steve is correct. When I check off the “manually manage” radio button and then hit apply it asks if I want to sync with this library and replace the content on my phone with the content in this computer. If I hit cancel then manually managing doesn’t work. I have several Macs running several versions of OSX and several iOS devices. This makes it a nightmare to manage content. What is wrong with just a simple Drag and Drop? It is here, put it there! Everytime I talk to Apple it is like I am doing something wrong by owning too much of their hardware. We wouldn’t want people to use their phones to download ILLEGAL MUSIC and then get it right into their library, would we???? I swear to god, this is why they don’t enable simple like drag to iTunes (on iOS). Anyone got a better explanation? There is none after all these years. You can’t possibly think that people have their own vast CD libraries or have borrowed an AudioBook from a Library service, or have Podcasts directly from other sources, or even personal recordings? The one and only possibility is to buy all your music exclusively from Apple! EVERY time they change their formats, policies or hardware, which is frequently too predictably often. Thank you SO MUCH for this. I’d all but given up on using iTunes, usually opting instead to drive to the nearest place with free wi-fi and download directly to my iPad. You. Rock. I can’t get this to work. I have the settings accurate. When I drag the song over to the side bar, it just bounces back. At first I thought it was happening so fast I just didn’t see the rotation, but the song is not on the iPod. I’m using an old iPhone, I don’t know if that matters. There are many reasons why someone would want to move “paid for” music from different sources onto a devise. I don’t have, nor do I want, all of my music in iTunes on my computer. I’m constantly battling at keeping my storage down on my laptop. It cannot be denied that iTunes is important for iPhone/iPad/iPod users. However, I think it’s not so friendly or convenient for most of people. Some 3rd party software like FonePaw iOS Transfer or Dr.Fone will be more useful. Like copy music from computer to iPhone/iPod without iTunes. THANK YOU, THANK YOU. After many wasted hours, useless downloads, and elevated blood pressure, you’ve provided a simple solution to move music and lectures onto an old iPod. You should put a donate button on this post. I would buy you a drink. Cheers! This doesn’t work in 2017, because now you have Apple Music. 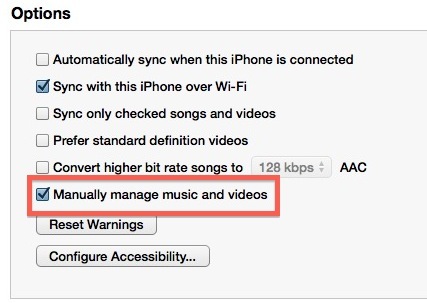 This does though – go to settings, music, scroll down turn off iCloud Music Library. Back in the hated iTunes, drag and drop your MP3s from finder to the music directory on your iPhone as shown above. Now, on your phone, turn back on iCloud Music Library. When prompted, select the merge (rather than delete) option. After a few minutes the music library on your phone will show both your iTunes library albums AND the mp3 albums you added. It it not instantaneous, it takes a bit for the Apple Music stuff to show up again. It’s 2018 and this still works SO WELL! Has saved me hours of looking for apps to transfer the files. I’ve also just done this for my iPad and again works seamlessly.